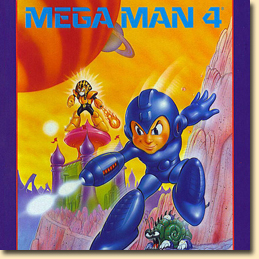 Mega Man 4 is a video game developed by Capcom for the Nintendo Entertainment System. It is the fourth game in the original Mega Man series and was originally released in Japan on December 6, 1991. The game was localized in North America the following January and in Europe on December 14, 1992. The game also saw later re-releases on the Japanese PlayStation and mobile phones, the North American Mega Man Anniversary Collection, and the Wii Virtual Console. After the third defeat and supposed death of Dr. Wily, the Earth comes under threat from a mysterious scientist named Dr. Cossack and his eight Robot Masters. Fearing the worst, Dr. Light sends Mega Man to save the world once again.